All of our products are made in the USA and are available for wholesale. Our Gremlin bells act as a guardian against all sorts of unwanted occurrences. If you're a biker, you'll love to ride with these bells. Fantastic gifts for bikers of all breeds! Give it to a rider as a gift and you double the protection. Comes with a story card, key ring, and zip tie to connect it to your bike. Measurements: 1" tall x 7/8" wide. All of our products are 100% American Made and are available for wholesale. 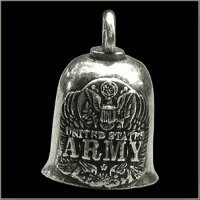 gbells.com - Copyright © 2019 All American Gremlin Bells®.